Winners To Be Announced At Award Ceremony November 19. Suffolk County, NY - November 2, 2018 - Suffolk County Executive Steve Bellone today announced that the Reclaim Our Water (ROW) Film Contest for public service announcements and short films will be accepting applications until November 9. The winners will be announced at an awards ceremony held at the Long Island Maritime Museum November 19, 2018, coinciding with World Toilet Day, a U.N. international day of observance designed to spur action to improve the global sanitation crisis. 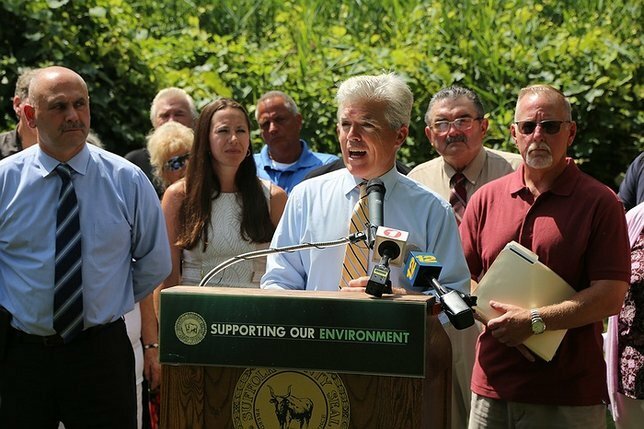 “Public education plays a critical role in ensuring that residents understand just how important our efforts are in protecting our water quality on Long Island," said Suffolk County Executive Bellone. "This contest is a terrific opportunity for anyone to raise awareness by developing their own creative and informative films to explore this substantial environmental issue." The Suffolk County Department of Economic Development and Planning in collaboration with the Suffolk County Film Commission has run the contest since 2014. Filmmakers are judged on creativity and originality, quality, technical accuracy, and content of their public service announcements or short films, that can range from 15 seconds to one minute in length. The contest supports public education efforts to inform Suffolk County residents of pollutants that harm our water quality on Long Island and efforts underway to reverse the decline. This includes Suffolk County Executive Bellone’s Reclaim Our Water initiative, a comprehensive plan that aims to reduce nitrogen pollution from cesspools and septic systems, Suffolk County has nearly 360,000 outdated septic systems and cesspools that have resulted in pollutants causing beach closures, restrictions on harvesting of shellfish, harmful algae blooms, and fish kills. As part of the Reclaim Our Water initiative, Suffolk County has instituted a Septic Improvement Program, which provides homeowners who upgrade their systems with the new technology grants of up to $11,000 to offset the cost of one of the new systems. Since the inception of the Septic Improvement Program in July 2017, there have been 41 completed installations with 59 applications currently approved or under review. This May, Suffolk County installed a nitrogen-reducing Innovative and Alternative On-Site Wastewater Treatment System (I/A OWTS) at Lake Ronkonkoma County Park. The new advanced system will remove more than 200 pounds of nitrogen annually. For more information about the contest, visit the Reclaim Our Water contest website here. Subject: LongIsland.com - Your Name sent you Article details of "Suffolk County Executive Bellone Announces Submissions for Reclaim Our Water Film Contest Open Until November 9"